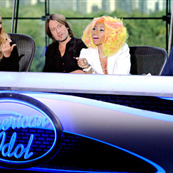 American Idol, Season 12, Episode 1 recap. She’s arrived on reality TV, dah-lings! Last night Mariah made her Idol debut. Is she a good judge? How many times did she sing-speak? How fake exactly is her feud with Nicki Minaj? We’ll get to all that in a second but first I want to let you know that, while yes, this is an American Idol recap, we’re not going to talk about anything other than Mariah Carey here. Do you really care about who’s singing on this show? It’s 2013, of course you don’t. 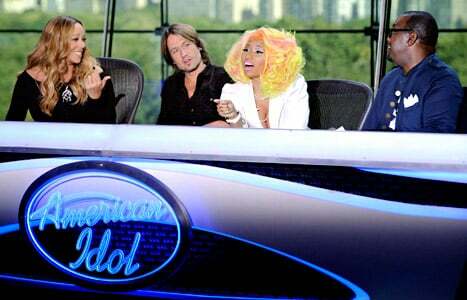 So the bad news for American Idol is that Mariah’s not a very good judge. The good news for us is that she’s still very good at being Mariah Carey. What we love about MC is that she’s so unwilling to bend to anyone’s standards or expectations and something as insignificant as her new $18 million paycheque is not going to change this. The Idol producers have clearly tried to correct this by instructing Mariah and Nicki to antagonize one another and Nicki lays it on THICK. The episode kicks off with a confusing and clearly staged fight about Nicki’s hat. Mariah says that if Nicki can wear a large accessory then she should be allowed to bring her dog to the panel but it’s not really clear what the problem is…because there is no problem, the drama is fiction. What’s REAL though is how embarrassing it is during the one moment when Mariah tries to add fuel to this non-fire with…a Mean Girls reference. You may or may not know that Means Girls is MC’s favourite movie. You know at the beginning of her song Obsessed when she says “and I was like ‘why are you so obsessed with me?’” -- that’s Mean Girls inspired. She’s doing Regina George. She loves this movie, it’s a BIG deal for her, so obviously it came up on Idol last night. When getting her makeup done, Mariah slipped into Regina-mode and said “I want to lose 3 pounds”, a line from the movie. Nicki didn’t recognize this and they get into a weak-a** fight about it. This is the kind of thing I’ll continue to watch American Idol for. I’ll watch to see Mariah Carey reveal what she cares about, which so far is just herself and Lindsay Lohan movies from 2004. In terms of viewing hours, Idol’s a big time commitment, so save yourself the time and check back here each week for the best of the worst of Mariah’s Idol career.